When someone has grid connected solar panels, they are usually trying to maximize total output, as they can sell all power straight to their power utility through the wires connected to their home. With off-grid systems, there is by definition no connection to the grid, so when you generate your own electricity, you are in a ‘use it or lose it’ kind of situation. As we’ve written elsewhere, solar electricity generation in an off-grid home isn’t about producing the maximum possible amount of power, it is about trying to make sure that you don’t run out. Further, there is great variation in the amount of sunlight available over the course of a year. Here in Ottawa there is four to five times as much energy available from sunlight during the long days of June than in December. On top of that, the cold and dark parts of winter require a lot more electricity to power things like lights and heating systems. Off-grid solar systems need to be designed to cover these winter needs, and so overproduce during all of the warmer and sunnier parts of the year. 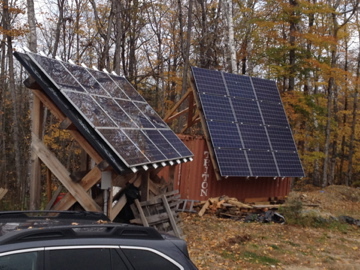 Putting all of this together, it means that most off-grid homes waste a lot of the electricity that the panels produce. 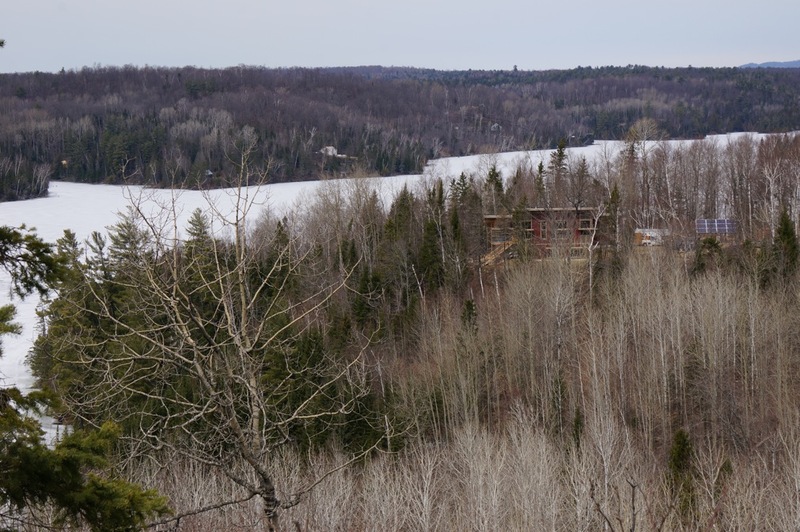 Up until December of 2018 this was the exact situation for the Manitou Bay house, where we were only using about 20% of the total power that the panels could have made available. During much of the year, our battery bank was full or nearly so, and all of that extra electricity was left unused. Knowing about this waste nagged at us, that we had all of this electricity with no place for it to go. We knew it was possible to do better and so made a plan to fix things, but due to it being somewhat lower priority as well as some unforeseen delays, it ended up taking almost three years to put that plan into action. We have now installed some new hardware that allows us to utilize much of that wasted power. In principle, all we have done is add an automatic system that switches on some electrical devices anytime there is extra electricity available – on bright and sunny days. These extra electrical loads are called ‘opportunity’ or ‘dump’ loads, and need to be those things that are useful to us even though they only turn on during sunny days. This means that it can’t be things that we absolutely require, or those that we want available at a moment’s notice. We currently have one major need that fits this description, which is supplemental heating. Up until now much of our active heating has been accomplished with propane. The new system will do space heating through all the colder months, and make hot water for showers and the like during all of the summer months. We expect that this could cut our propane use at the house by a third (see below). In the next couple of years we will have one more use of intermittent power, to recharge an electric car, when we replace one of our current gasoline powered ones around 2021 or so. This principle, of using electricity when it is cheaper or more easily available, is one of the main ideas that will underlie the ‘smart grids’ of the future. Right now most users simply turn on any power needs that they want whenever they want them, but in the future we will be able to set our heating, cooling, charging, and other devices to automatically turn on when power is cheaply available, and turn off when it gets more expensive. This will save everyone money, and will allow more renewable energy into the grid and give greater flexibility to utilities. What we have done with our upgrade is to make our off-grid home something of a ‘smart’ microgrid. How the relay works (the rest of this post will be a bit more technical). In our situation, we are using the voltage of our battery bank to regulate our intermittent loads. When the batteries are full and the voltage is high the switch turns on, and when the battery voltage falls to about 80% the switch turns off, as we need to keep a healthy amount of power in reserve for all of the normal electricity needs. Our charge controller (system details here) has the components and software built in that can control a switch based on voltage. However, this switch can only control a low power direct current (DC) circuit, not the higher energy alternating current (AC) electricity that is typically used around a home. So this is why we had to add new hardware in December, installing a relay so that the DC circuit could control AC circuits that go out to the heating and plug loads where we have the intermittent power consumers. How much electricity will we effectively gain by adding the relay? Before adding this relay, the house consumed a bit less than 5 kWh per day of electricity year-round, or about 1500 kWh per year. Based on a power production estimate that we had done when our solar system was installed, which is now doubled since we doubled the number of panels, our solar system could produce up to about 7500 kWh of electricity per year. Now that we have the relay, we will be able to capture much of that excess. From November to April we will put every extra kWh into space heating with a 1500 watt plug-in heater. In December this is only anticipated to be about 2 kWh per day, while in April there should be an extra 20 kWh per day. From May to October, the extra electricity will be routed to a standard electric hot water heater. We estimate that with the number of showers that we take that we will consume around 10 kWh per day of electricity through the water heater, which still will leave a fair amount wasted during the sunniest months of May to August. Add all this extra power up, and we will use around 3600 kWh of additional electricity. We should now be using about 70% of the total output of our system instead of the 20% that we managed before the relay was installed. See the table below for specifics. We’ll wrap up by going over the greenhouse gas emission and financial reasoning behind this project. Before adding this relay the home was using about 400 gallons per year of propane. Adding 3600 kWh of electric heat should reduce the propane consumption by around 140 gallons. By avoiding burning all of that propane, we will reduce our CO2 emissions by a full metric ton each year (this is a part of our 5 year plan to reduce our emissions by half). The cost savings for that propane not purchased will be around $350 per year as long as the system keeps running. The relay work cost a bit less than $1000 and the electric hot water tank cost about $500, and so the work will pay for itself in under 5 years. Finally, I ought to mention that even with this increased efficiency, solar electricity off the grid isn’t cheap. Considering all the panels, electronics, batteries and labor, and the fact that most of these components only last for 10 to 20 years, even with the relay our solar electricity still costs around $.50 per kWh. This compares to power from the local utility, HydroQuebec, that comes in at around $.10 per kWh. With the secluded location of the home off-grid was the only sensible choice, but the costs do make one appreciate the value one gets by tying right into the power grid. Special thanks to Tom Hewitt at NetZero Construction for his assistance with the solar and DC circuit work, and Jean-François at Lamarche Electric for all of his work installing the relay and AC circuits. From the very beginning of our house building project, I had a lot of ideas about what I wanted to accomplish with the architectural style as well as the interior layout and design. While I think that I would have ended up with mostly good choices by working it out by myself, the assistance of our architect Anthony Mach was invaluable. Even though I had a much clearer notion than many people do going into the early phases, I still often needed that access to an expert opinion about what is doable and how to make all of the parts fit together. And don’t even get me started on the process of turning the rough sketches into final blueprints, I don’t have anywhere near the knowledge to be able to put together those technical details. We already had a fairly well-developed plan by the time we went to Anthony, so I feel pretty good that out of this initial list, the only item that was dropped was the large stone fireplace. It turns out that doing these the old fashioned way with larger real stones is both very energy inefficient as well as incredibly expensive. It turns out that the vast majority of the ‘stonework’ that one sees on both the interior and exterior of today’s buildings is actually painted concrete. It is relatively thin pieces of veneer that can be added to almost any wall, and the process now yields fairly realistic looking stone. With this entire project I’ve wanted things to feel as authentic as possible, and fake stone just wasn’t something that appealed to me. As the plans developed further, we realized that the simple clean lines of a wood stove and interior stove pipe were just as good of an aesthetic fit while being much better in terms of cost and energy efficiency. We, along with a lot of others buying and building houses today, wanted an open concept design, with a single great room containing the kitchen, dining, and living spaces. I have heard and read quite a number of things about the growing popularity of the open concept, and it seems that there are two major drivers. The first is a greater desire for families to spend time together. With parents working more hours, kids doing more activities, families want to spend the few hours where everyone is at home together. The other trend is for increasingly casual living arrangements. People no longer want to hide away the mess of the kitchen and to eat in a formal dining room. This fits just about right with our own decision about building this way; this was always intended to be a place for the family to be together. Opening up the living and cooking spaces to each other solve all of these issues, putting everyone all in one space. We ended up with a room of 18’x38′ (680 ft 2), which has been fantastic for family time and groups up to about 15 people. We often are cooking and doing cleanup at the same time as we entertain or keep an eye on our young children. A screen porch was another thing that was at the very top of our list of desired features. In our climate it may only be porch weather for four months of the year, but during that time it is the best place in the house. It turns out that screen porches aren’t all that popular here in eastern Canada, and I actually have no idea why. In Minnesota, where I grew up, basically every cabin, and many homes, have screen porches. Granted, the mosquitos are the size of sparrows there, but there isn’t exactly a shortage of biting insects here in the region around Ottawa. The bug season makes enclosed spaces awfully appealing for outdoor living throughout the wet northern temperate climates. In a lot of the modern architecture photos and articles that I’ve looked at, I often see whole walls that open to make indoor/outdoor spaces, and decks and porches seldom seem to have any bug protection. This may work in California, but that sort of design certainly does not fit well in a place where the biting insect season almost completely overlaps the warm months. Most multi-story homes have the main living areas on the main floor, with bedrooms above. In a great many cases this really does make the most sense. One can enter the house and go straight into the more public spaces, with the bedrooms tucked away up a staircase. However, it isn’t so great if your home has a view that you would like to take advantage of, as those views generally improve the higher one goes, and I don’t think that a lot of people spend hours in their bedrooms admiring the views. In our case, we had a perfect setup to flip the house upside down. We planned from the beginning to have a walkout basement lower level, and we had tremendous views that we wanted to be able to appreciate. Pushing the house into the side of the hill also meant that it was only five steps up from the driveway to the upper level. So while I don’t think that it is for everyone, I wouldn’t do it any other way if we were building again at this site. The advantages are that we are able to really appreciate the views that our hilltop site affords, the space is much brighter, and it tends to be warmer upstairs which is a boon most of the time (and conversely, the bedrooms stay cooler at all times of the year which I appreciate when I sleep). All that said, there is one significant drawback – even with some insulation to deaden the footfalls, it can be difficult to stay asleep downstairs when there is a 3 year old running wind sprints back and forth above your head at 6:00 in the morning. Our downstairs is then taken up by three bedrooms, one full bath, and mechanicals/storage space. We kept the bedrooms to a relatively modest size, each at about 12’x12′. This is big enough to have a full set of bedroom furniture but leaves relatively little room to spare. Some people now put in massive bedroom suites, but it seems to me that bedrooms are mostly just for sleeping and not for hanging out. And just to show that I’m not entirely self-consistent, I’ve included a picture below of the windows that we put into the master bedroom. I couldn’t resist taking advantage of the view even if we don’t spend that much time in there appreciating it. There are dozens of popular styles for homes, such as Prairie, Tudor, Craftsman, and many others. Though there are some cultural and climatic reasons for choosing one style over another, the better part of the decision making comes down to aesthetic choices. Through all phases of the design process, I spent a good deal of time looking at architectural and design websites, articles, magazines, and photos. I was particularly drawn to aspects of the contemporary style, and so making the decision really came down to that appeal. To really dig into the sort of places that I found inspirational, I found even more tightly defined terms like “modern rustic” or “mountain contemporary”. These styles really have become quite popular with those who build nice houses out in the woods, fields, and mountains. Staying within a given style lends a sense of continuity to a home, from the inside to the outside, and from room to room, though there are certainly some eclectic homes that stand the test of time as well. If you search around for terms like these in architectural magazines and websites, you’ll find no shortage of examples that have a similar feel to our own place, relatively modern looking with lots of natural wood, stone, and big windows to take in the views. I just hope that in 20 or 30 years time that our choices don’t look as dated as all of the 70’s lime green, orange, and dark faux wood paneling that my parents installed when they built their own cottage back in the day. Finne Architects. Extremely high end custom contemporary homes. They are absolutely beautiful, but I don’t even want to know what the costs are. Nils Finne and his team make a large amount of built ins, custom furniture, and unique designs for each and every project. Method Homes. A prefabricated home builder. Some of their home styles are quite architecturally similar to our own final design. Go Logic, particularly this passive house they built. My wife and I both love natural wood finishes, and I am exceptionally fond of the bigger timbers used in timber framing. However, in the earlier part of our own design process, I learned why there are so few timber frames being built today. First, building with big timbers is expensive. The wood costs are significantly more, but so are the costs of cutting the traditional joinery (needed before the easy availability of strong metal nails and screws). Second, it is quite difficult to insulate a timber frame building. The most common way of doing so is to build the house twice; first build the timber frame, then build another full wall and roof assembly outside of that which can be insulated normally. At the same time, the timbers are beautiful. Many people generate a similar look with false beams or wrapping regular construction lumber in naturally finished boards, but just like what I mentioned about faux stone above, I find that many of these attempts can end up looking inauthentic or cheap. With all this in mind, we found a few places in our home where big dimensional timbers made a bit more sense, using a building method commonly called a ‘hybrid’ timber frame. The first location was our screen porch. Here, there aren’t any issues of insulation to deal with, as the whole structure is just a shell to keep out insects, with cedar floors, plexiglass lower panels to prevent anyone from falling through, and screen above. Second, we used big beams to hold the roof trusses on the big overhangs. We put 4′ overhangs around the entire home, and though there are multiple ways to support this sort of detail, we did so with large douglas fir beams, on which all of the roof trusses rest (see the time lapse installation video here for a look at the work the fir beams do for the roof). Finally we used white pine beams for the floor joists and supporting beam for the second story. We were going to need to put in joists anyway, so we decided to use 4″x8″ joists, and a 10″x12″ supporting beam. This provides a beautiful ceiling for the entire downstairs level, and should be rock-solid for the lifetime of the house. So for the heavy beams that we included, they all serve very functional purposes, which felt like an important thing to me, that it was not simply decoration. For all of our timber work, we used simpler joints held together by screws rather than the traditional mortise and tenon joinery, which allowed all of the installation to go much more quickly. Finally, I want to make some comments about building for the long-term. So many decisions in home building (and too many other domains as well) are made looking only at the short term. For builders, it usually makes the most sense to build the most inexpensive construction that they can get away with, and then invest more on those parts of a home that really catch the eye of the buyers, like the fancy kitchen, spa type bathroom, or big walk-in closets. People don’t tend to be very good at evaluating what is behind the final finishes, nor are they good at imagining what the future maintenance, replacement, utility bills, or other costs will be for a home. Further, people only own a given home for an average of 13 years, so any feature that doesn’t do well on the resale market is less likely to make it into the average home. This is of course not a complete picture. The building code improves steadily, requiring constantly better insulation, air sealing, air quality and more. And there is a growing trend toward green building, emphasizing reduced energy use and healthier indoor air. Unfortunately, these are still relatively niche markets, and the average new home being built is far less than it could be. For our own project, we built a place that we hope to never have to sell during a lifetime, and if things go really well, our kids will continue to use it well after we are gone. With those kind of goals in mind, it is much easier to think about a 50 year time frame, and to be able to justify the costs of doing things ‘right’ the first time around. If we’ve succeeded at this, we may have very little maintenance and renovation work to do on the house itself for decades to come. Only time will tell us if we succeeded. So rather than discuss all of the details individually, I just include a long list of the details that we included for the sake of long-lasting quality. 4′ overhangs on all sides of the building. Reduces the exposure of the siding and base of the house to sun, rain, and snow, which should extend the lifetime of the siding. Low maintenance landscaping and plantings, should require little to no watering or fertilizer. We didn’t originally plan to do any formal energy modeling for our home. It actually only came about because of our relatively last-minute decision to seek LEED certification. One requirement of the LEED process is to do an evaluation of the energy efficiency of a home, and this includes a fairly complete description of the building’s size, orientation, insulation, electrical appliances, etc. Using all of this disparate information and applying some standard assumptions about how a typical family uses a home (e.g., amount of hot showers, thermostat temperature, etc. ), energy modelers are able to put together estimates of total energy use for a home. Below is our “Home Energy Rating Certificate”, which shows the overall estimates, including the major details about the home, the systems, and expected energy use. To boil a house down to a single number, many efficiency experts use the HERS rating. This is an evaluation of how much energy the modeled house uses as compared to a house that just meets the 2006 International Energy Conservation Code. Climate and house size are controlled for, so as to be better about comparing apples to apples. As you can see in the certificate, our home achieved a HERS score of 23, whereas the reference home is always counted as 100. While I won’t actually go through the calculation, this number is the percentage of energy that the modeled home uses as compared to the reference, with an adjustment for self-generation of power through things like our PV panels. In comparison to the ‘standard’ home, our place brings the energy demand down by over 70%. The rough breakdowns in energy use in kWh/year are the figures that I find most interesting here. Our home is projected to use a grand total of 19271 kWh/year, with 4785 kWh coming from electricity produced by the solar panels, with the balance of 15465 kWh provided by propane. So how does this compare to our actual use for the year of 2015 (well, November of 2014 to November of 2015)? During that time, we used exactly 400 gallons of propane, for a total of 10,800 kWh of energy. We also burned about half of a cord of maple and oak firewood, which provided roughly 3000 kWh of heat. The best measure of our solar electric use is actually the energy used by plug loads during the year, of 1400 kWh. This figure is actually a significant underperformance for our expected solar electric contribution for a couple of reasons. First, the batteries didn’t age well in their first year of use due to some overly deep discharge in their first months of service, and second, that more power was ‘wasted’ than expected, as excess power cannot be saved if it is not used and the batteries are full. I am putting together a system to use some of that excess power and will write about it once it is up and running. Needless to say, this puts our actual energy usage for the year at 15,200 kWh, much less than the model-predicted figure of 19271 kWh. This is no surprise, as we are inhabiting the home only about half of the time, and probably taking less showers and using less technological toys than the average household. I would imagine that if we were there full-time that our actual energy usage would end up quite similar to the model’s projections. Another interesting set of details that came out of the modeling were estimates of heat loss through all of the different components of the housing envelope (See below – First document in English, followed by a more detailed one in French. Some of the text in the English is wrong in the columns but correct in the chart). To stay in kWh, I’ll work with the numbers from the French document. The total amount of heat needed from the active heating systems is 9286 kWh (25% of the reference home). Part of the reason this figure is so low is due to the passive solar heat gain coming through all of the windows, to the tune of 4306 kWh/year. Putting these figures together shows that over 31% of the total heating needed for this home is accomplished by sun streaming in the windows. I’ve taken just enough of a look at the passive solar heating literature to know that this is roughly as high as one should go with passive solar heating in a home unless one is willing to endure unwelcome overheating on warm sunny days in the winter and spring. Even with our place, I am finding that on bright sunny days in February and March that the upstairs of the house can exceed 30 degrees Celsius (86 Fahrenheit) with the heating turned off. I have actually found it to be good for the spirit to be able to open the windows and wear shorts on those blue bird days in February. The other great thing about this heating breakdown is that it shows how much heat loss to expect from each component of the home. It is no surprise that the above grade walls are the biggest component, since they make up much more surface area than any other part of the home. The walls would have been one of the most expensive parts of the home to upgrade, due to the amount of materials needed to cover that much area. The next highest contributor is air infiltration, at 2783 kWh/year. When the house was half-complete a blower door test showed that we had an air-tightness of 1.47 ACH@50Pa, but as I outlined in this post, the house is probably tighter now and this heat loss lower than the model suggests. The concrete slab and foundation walls, at 2314 kWh and 1435 kWh respectively, are probably the only places that I wish I would have added insulation. It would not have been that difficult or expensive to add thicker layers of rigid foam insulation, and I’m fairly sure that it would have been cost-effective to do this upgrade. I guess that one advantage of the current state of things is that the downstairs bedrooms are always cooler through the summer, making sleeping comfortable even on the hottest days of the summer without any air conditioning. I just wanted to reiterate one more time the usefulness of both active and passive solar in reducing the need for other, usually fossil fuel, sources of energy. If we were to eliminate the solar gain through the windows and disconnect the solar panels, the model suggests that we would need 24,550 kWh/year of power from propane, or 909 gallons. However, we already get 4306 kWh of heat through the windows. The above models also don’t account for the new solar panels added this fall, which together with the original installation could produce about 9850 kWh of power per year . As I alluded to above, I am in the middle of putting together a system to use up much of this excess electric power for space heating in the winter and domestic hot water heating in the summer. If I were able to put all of this excess capacity to use, this would mean our total needs from propane drop to a projected 9074 kWh. Considering that we already use much less energy than the model projects, my hope is to cut propane use for next year from 400 gallons to 250 gallons or less. With continually improving technology and dropping prices, I can already see the day arriving, perhaps 15 or 20 years down the road, when it may be possible for us, and off-grid homes in locations like ours, to ditch the propane without breaking the bank. I’m looking forward to that day, when I have all of my energy needs met from the sun shining down from above. So how close is our home to meeting the ‘Passive House’ standard? One of the original inspirations for our home was the Passive House standard. I’ve discussed this a bit in another blogpost, but briefly, this is a standard for vastly reducing the energy needed to heat and power a home. That standard allows for 15 kWh/m2 of heating per year, which is quite difficult to meet for a single family home in the climate here in Ottawa, Canada. Even with all of the things that we did to build a better home, the model still suggests that we are at 47 kWh/m2 per year, so nearly 3 times the amount allowed for Passive House certification. There are just a small handful of homes that have reached this certification in eastern Canada, and some of the professionals that I’ve spoken to around here think that such a low heating requirement isn’t currently a reasonable goal in our climate. It is much colder here than in the area where these standards originated (mostly in Germany), where this number makes more sense. Here, the local homes that are pursuing certification need to have walls roughly two feet thick. We felt that it made more sense here to build a ‘pretty good’ house, and then make up some of the difference through such means as renewables. In the future, it is almost certainly going to become easier to meet and exceed the Passive House standard, as green building techniques improve and become more widely known, and as technological innovations continue to produce better products. Anthony Mach, the architect that we worked with on our house, gave a presentation about our house in the spring of 2014, covering some of the basics of passive homes, passive solar design rules, and how our house fits with these design principles. This presentation was given to an architectural design class at the school, and acted in many ways as an introduction to green and high efficiency building for these students. Rather than explain it further, I will let the slides from his presentation speak for themselves, see the pdf linked below. In years past, the mechanical systems and appliances within off grid homes looked quite different from typical grid tied homes. Electricity generation was extremely difficult and expensive at the home scale, so there was much less electrification. Instead, off gridders used other technologies like wood stoves, kerosene lamps, and propane powered appliances. One can still find most of these electricity-light home appliances, including such things propane lighting and propane powered refrigerators. However, these systems are made at such a small scale and are in such small demand, that they are quite expensive and do not perform incredibly well. Thankfully, an off grid house today can maintain essentially all the comforts of on-grid living, as long as one is careful about making choices. Two trends have allowed this to happen. First, solar power generation and storage is falling quickly in price, and it is now possible to have a regular supply of electricity at a home for a manageable cost. The second trend is large increases in efficiency of all of the electronics used in our homes. The normal, high efficiency, often Energy Star approved, appliances and other electronics of today use just a fraction of the power of their predecessors. Put all of these trends together, and it is now possible to use all off the shelf products from standard stores, as long as the most efficient of available options are chosen. The one thing that is difficult to do with electricity in an off-grid home is heating. Whether it be home heating, water heating, the kitchen range, clothes dryer, all of these are energy hogs and the electric versions are not affordable in today’s off grid home. In our case, we use propane to do most of this heavy lifting (though I hope to eliminate the propane at some point in the future). Below is a run-down of all of the systems that we have put into our home. We have a propane range, one of the basic models that was available at the local Sears (the Kenmore 5.0 cu. ft. Freestanding Gas Range w/ Variable Self-Clean, Model #74132). This unit has 5 burners on top, and propane burners at both the bottom and top of the oven. This unit does require some electricity for full functionality. The range has electronic sparkers to light the burners, though these can be lit with a match or lighter if there is no power. The oven, however, requires a larger and more constant supply of power, as a heating element stays on at all times when the oven is heating. I have not been able to find the exact power draw for the stove heating element, but I think that it is around 200 or 300 watts. It would have saved a bit of electricity if there were a pilot light inside the oven, but these models are getting harder to find and are apparently not always as safe as the electrically controlled ovens. A refrigerator is one of those modern conveniences that would be very difficult to live without. And with refrigerated and frozen foods, it isn’t possible to turn off the power when you are away, unless you empty out the whole thing. As I mentioned above, one can run a refrigerator on propane, but these units leave something to be desired when compared to a typical fridge. Thankfully we produce enough electricity to keep a fridge powered. We have a Kenmore 596.6938, a 20 cubic foot model that is rated to consume 459 kWh/year. There are a few fridges that have power consumption as low as 350 kWh/year (less than 1 kWh/day), but they were a bit small for a family that cooks a lot and does a fair amount of entertaining. We wouldn’t have necessarily needed a dishwasher, but it is a nice convenience. We picked up an energy star rated Kenmore model 630, which Energuide lists as a 269 kWh/year expected power usage. We generally only run when full, and t requires approximately 1 kWh per load of dishes washed when run on ‘eco’ mode. We chose a high efficiency front-loading washer, again by Kenmore. This is one of the more efficient models available. Front loading washers tend to outperform top loading models, and provide one additional benefit – an extra powerful spin cycle. By spinning at several thousand RPMs, the vast majority of the water is pulled out of the clothes before one even takes them out of the washer. This allows a very quick air drying, hung either outside on a line, or in the house on racks. We decided that it would not be worthwhile to try to add a dryer. Electric units consume too much electricity, gas dryers are more expensive, and we already were getting most of the drying done by the high speed spin cycle. In any tightly built house, one needs to provide for ventilation. In older and draftier homes, a lot of air leaks into and out of a house just through little cracks around joints, windows, and doors, but with new high efficiency construction there is a strong risk of the air getting stale. Our home ended up very tight (see past post here), so we needed mechanical ventilation. This is accomplished by a heat recovery ventilator (HRV), which serves two purposes. First, the HRV circulates stale air out of the house while bringing fresh air in. All sorts of gases can build up inside homes, from cooking, off-gassing from materials, even simple human habitation, and these are vented to the outside when bringing in fresh air. Second, an HRV exchanges heat from the venting air with incoming air in a heat exchanger. This allows the home to hold onto more heat in the winter, and keep out some of the heat in the summer. We settled on the LifeBreath 155 Max, which sized nicely to our air circulation needs, while consuming only 40 watts on the low setting. Just in the last 3-4 years, there has been a sea change in lighting, as LED technologies have become cost-competitive with the compact fluorescents and incandescents that came before. While still somewhat more expensive than these other choices, LEDs last much longer (often estimated around 20 years), and consume only a fraction of the energy. We put in all LED lighting to minimize electricity use. Some of it is in specialized fixtures, but most of it is screw in or pin type bulbs, and this was only a bit more expensive than other options available. When lighting up the house at night, the total lighting loads seldom exceed 100 watts. We use propane to do our domestic hot water heating, with an indirect water heater powered by our propane boiler (see post about our heating system here). Our boiler has a set of heating loops that come off of it, and one of those loops goes inside the water tank. A heat exchanger consisting of a set of copper coils containing the heated glycol pass heat to the domestic water in the tank. Because this setup uses a relatively powerful boiler when heating the water, it is actually able to provide continuous hot water for such things as bathing. The water heater is set up to take precedence over space heating, so there is always a good supply of hot water. While it was appealing to have no phone or internet at our home in the woods, it wasn’t practical. Both my wife’s and my work depend on being internet connected, and it can often be important to be able to make phone calls. However, since we are so far off the beaten path, we have no phone lines, and only a very weak cellular signal at our home. To remedy this situation, it took a few different steps. The good news was that the phone and internet systems combined require less than 10 watts to keep a constant and high quality connection. To improve the cell phone reception, I set up a cellular signal booster which consists of several parts. First, there is an antenna mounted to the outside of the house which is pointed at the nearest cell tower about 5 miles away. From this antenna, a coaxial cable is run into the home into a cell signal amplifier, which is a box about the size of a typical modem. This is then connected to an interior antenna. When one uses a cell phone, the signal is received by the interior antenna, passing through the amplifier and exterior antenna to communicate with the cell tower. This system actually works very well, bringing the signal from one that is so weak that calls often cannot be connected, up to a very strong signal (5 out of 5 bars of reception listed on the phone). To have a ready internet connection, we connected a cellular modem. This works just like any other modem, but instead of connecting through telephone or cable wires, it communicates over the cellular network just like a smartphone. Our local phone provider has a ‘family plan’ for data sharing, which we now share between smart phones for myself and my wife, as well as with the wifi network created by the cellular modem. Data is more expensive this way than through a wired connection, but as long as we don’t use the network for high bandwidth activities such as video streaming, it works very well. It is a bit tricky to build an energy budget for an off grid home. It requires much more planning than with a typical home, as one has to figure out all of the details in advance. At the beginning of the planning process, I made a list of all of the electricity that we could expect to use, and then followed that up with trying to make sure that all purchase decisions would fit into that energy budget. As I mentioned in a past post, the one significant mistake we made was to have a heating system that required electricity to run – it wouldn’t be much for a typical house, but is tough for an off grid house in the winter. It is currently much more expensive to generate energy off the grid than to buy grid power, so one has to be very careful to make everything as efficient as possible. If we were connected to the local utility, Hydro-Quebec, our electricity rates would be less than $.10/kWh, some of the cheapest power available anywhere in the world. However, with our backwoods location, generating our own power was the only viable option. When I estimate the cost and expected lifetime of all of our solar panels, electronics, batteries, backup generator, etc., our power cost will end up being much closer to $1/kWh, at least 10 times the cost of grid power. This means that economizing and conserving is the only way to keep the total cost of power reasonable. Below I have attached a fairly accurate version of our energy budget updated to account for our first full year of use of our home. At all times we run a refrigerator, an HRV, the solar electronics, and a few other electronics that make up our internet and security systems. In the winter, the boiler also runs nearly every day to keep the house heated. On top of that, we have pretty bare bones usage of power as compared to a typical home, and I’ve done my best to reduce the vampire loads down to almost nothing. Our total electricity usage for the past year was a bit less 1500 kWh, which makes an average of roughly 4 kWh/day. Our 1500 kWh of electricity usage is dwarfed by the typical household in Canada, which uses an average of 11,900 kWh (32.6 kWh/day). While our place is extremely efficient, I must make clear that one of the reasons our usage is so low is that we are only in the house a bit less than half of the time, as work and other responsibilities call us into the city far more often than I would like. If one factors in the power that we use in our rental in the city, we still are below average, but not by all that much. We are striving to reduce our energy consumption, especially of non-renewable energy, but it is a task that takes time to accomplish. One other disclaimer to make is that our electricity usage still makes up significantly less than half of our total energy use. The technology is simply not yet available (at any sort of reasonable price) to heat a house through a cold, gray, and snowy Canadian winter with solar power alone. Propane and/or wood are an absolute necessity to be able to stay warm out in the countryside. With the fast dropping prices of solar, batteries, as well as improved building envelopes and heating technologies like air to air heat pumps, this may become a possibility a decade or two down the road, but the time is not yet ripe. For better or worse, the property that my wife and I fell in love with was over a mile back down a private road, and our few other neighbors have summer-only cabins. There are no services of any kind that come down our road, no phone, no cable, no fiberoptics, and of course, no power lines. The neighbors heat with wood when needed, and handle cooking and a small amount of power generation with propane. I looked briefly into bringing power lines back to our site, but an off grid solution became the obvious choice when I realized that the price would greatly exceed $100,000 just to put in the power poles. I already had quite an interest in sustainable energy and solar power, so this provided just the impetus that I needed to pursue an off grid home. I’ll list the vital statistics of our system first, and then say a bit about how the system has worked so far, as well as the updates that have already been implemented. Any electrical grid starts with power generation, and ours is no different. The majority of the time, all of our electricity needs are supplied by solar panels. However, there are times when the panels can’t produce enough power (at night and on cloudy days) when it is needed. Generally the batteries serve the role of storing enough energy to get us through a couple of days without much sun. When the battery charge gets too low, the backup propane generator turns on, sending power into the house via an alternator to be used both to power the house and recharge the batteries. The electronics provide for energy transformations and communications. The charge controller takes high voltage power coming from the solar panels, and steps it down so that just the right amount and voltage (a bit over 48V DC) of power is passed on to the other systems. Most of this power is dumped straight into the batteries, which chemically store that electricity for later use. When power is needed for loads in the house, that 48V power coming from the batteries and charge controller is drawn into the inverter, which converts the power into the normal household power found in any home, 120V alternating current, which goes out through a standard breaker panel to the house. The inverter is actually an inverter/charger, so in addition to taking DC power from the batteries and solar panels out to the house, it can also convert AC power from the generator (or for others’ setups, the power grid) into DC power to charge the batteries. The Automatic Generator Starter is able to start the generator whenever the battery voltage falls below a certain level, ensuring that the batteries are never discharged too deeply. Finally the Combox provides an interface for controlling all of the other devices, as well as being able to connect to the internet, which I use to check the system remotely and send regular system status updates by email to myself. There is a simple rule of thumb that I learned from our solar installer when we were discussing our system setup, with the best orientation for stationary panels being due south, with an angle equal to one’s latitude on Earth. This maximizes the annual output of power from a given solar panel. We are at 45° north, so we ought to set our panels at the same angle to the ground. For our original panels, we were able to get this orientation, due south and at a 45° angle. Through our first winter, I realized that there are some nuances to an off grid system in the northcountry that aren’t captured by that rule of thumb. There are two main problems with following this rule. The first is snow. It turns out that panels set at 45° don’t shed snow as well as I’d hoped. The snow will clear after a day or so of sunny weather, but while the snow is still there, no power is produced. Clearing them manually works fine, but we are not always there to do it. The second problem is that an off grid home is not in the business of producing the maximum total power over the year, it is about always having enough power available to keep the house running. Our summer power loads are extremely low, as no heating is needed, days are long and so little lighting is needed, and we are outside much more often. In the winter, when there is already less sun, our electricity needs are actually much higher. These two problems have a shared solution, to set solar panels at a much steeper angle. This allows snow to shed off very easily, and squares the panels much better to the low angled winter sun. Of course it is possible to get around this problem with such things as seasonably adjustable solar panels, or the significantly more complicated sun tracking systems, but the simplicity (and reduced cost) of fixed panels is quite attractive. I would go so far as to say that if one is going to have stationary panels in the northern US or Canada on an off grid home, that orienting them for the winter is the best path to follow. In our first two winters, we were overly reliant on our (poorly functioning) generator through the winter, and so earlier this fall, we added just such an upgrade, an additional solar array set at an angle of 65° from the ground. These should greatly reduce the amount of run-time that will be needed from the generator in future winters. As you can see from the picture below, the new panels also are turned a bit to the south-west, which is intentional. There is a better clearing in the trees toward the west, and so the new panels are turned a bit so that they will be receiving direct sun for a greater portion of the day. Finally, I’ve attached the power production estimate that my solar installer created for me prior to installing the system. While a few details changed after these estimates were made, there is an incredible wealth of data here about our local solar resource, expected consumption of power at our home, the efficiencies of the various components of an off grid power system, and more. For any readers who may actually be considering building an off grid system, this is the sort of nitty gritty details that you will need to consider. Being a newcomer to living off of the grid, I did not make the best initial choices for our heating system. In order to help others to not make the same mistakes, I’ll both lay out what we did and how it was problematic, as well as how we went about fixing the problems for the future. We installed a hydronic heating system powered by a propane fired boiler (a Trinity LX150). The system has a heated concrete floor in the lower level with four zones (one for each bedroom and one for the bathroom), and two hydronic baseboard registers in the upstairs. This system provides amazingly warm and comfy floors in the bedrooms when we run the heating system. Some people with heated floors don’t get to have the warm foot experience that often with high efficiency homes, but this has not been the case for us. As the house is used primarily as a weekend retreat in the winter, we turn up the heat considerably when we first arrive. We have to wear warm sweaters when we first get in the door, but then have a full day where the floor is toasty warm. The secondary heating system, and the one that I enjoy using much more, is a free standing wood stove, a Jotul F3CB to be precise. It is a relatively small (42,000 btu) high efficiency stove out of Norway, but it is more than sufficient for our well-insulated home. The stove is located in the open concept upstairs, and in just a few hours it can take the 1000 square foot high ceiling space from sweater temperatures to shorts weather. We have only one full winter of usage to measure our consumption of propane and wood, so it is difficult to draw big conclusions from it, but the usage was about what was expected. In the 12 months up to November of 2015, we burned 400 gallons of propane across all uses, primarily for heating the house, but also for domestic hot water, the backup generator, and a propane range in the kitchen. My best guess is that 75% of that, perhaps 300 gallons of propane, went to space heating. For the wood stove, we burned just a bit less than a cord of wood last winter, and had a fire in the stove during at least part of the day during most every day that we were there last winter. the coldest days of winter), the heating system alone needs 4 kWh/day, which is almost the full amount of our target daily electricity budget. frozen water pipes, as well as a break in one of the hydronic heating lines. Steps taken to make the house resilient going forward. So we have no desire to repeat the emergency situation that we found ourselves in for a good chunk of last winter, and have taken quite a number of steps in service of making our home more resilient in the face of future mechanical problems. I plan to discuss some of these steps more thoroughly in future posts, so I’ll just highlight briefly here those that aren’t heat related. What did we do? Set the house to send daily emailed status reports giving conditions of the solar system, including power generated, power used, generator run time, battery temperature. These daily reminders tell me how the system is functioning, and I know that if I fail to receive one, that there is a problem with either the power or internet systems. Increase the amount of solar panels. During the first winter, the generator was needed relatively frequently over a 6 month period from the fall through the spring, and it was far too often for my taste. Therefore, we doubled the capacity of the solar system. Finally, we added a new backup heat source that would not be dependent on either our being there every day or electricity. We did this by using an older, simpler technology – a direct vent propane wall heater. These have been used for many years in garages, workshops, cabins in the woods, as well as in quite a number of off grid homes. If I had done more research about off grid heating, or if I had had better advice, I may have decided to handle all of our heating needs with a couple of these heaters from the beginning. The biggest advantage of these units is that they require no electricity at all to function. They have a pilot light and a milli-volt thermopile thermostat, which uses a temperature gradient to produce the small amount of current needed for the thermostat, and they rely on convection to circulate air past the heating elements. We have installed one to provide for some of the base load of heating, as well as to ensure that the house would never freeze again regardless of any issues with the electrical system. The only major downside is in efficiency, these direct vent heaters are only about 70% efficient, compared to the 93% efficiency of the boiler. This calculation would be assuming that we heat the entire house to 70 degrees (20 degrees Celsius) with just the wall unit for the entire winter. In actuality, we keep a lower set-point, and this unit will instead keep just a local area of the house at about 65 to 70 degrees, while allowing the rest of the house to be cooler when we aren’t there, and continuing to be heated by the hydronic system. This calculation is just an estimate of the average heating load, so this amount of heat wouldn’t necessarily be able to keep up with heating the whole house on the coldest days of winter. We selected the Empire DV215 heater, a 15,000 BTU unit, which sits in the central bedroom, radiating heat out to the rest of the lower level. We shall see in the coming winter how the upgraded heating system works out. Winter is now on the run, and I can report that the wall heater was an amazing success in terms of reliability and reducing the use of electricity with our heating. The heater was able to carry essentially all of the heating load for the house during the weekdays when we were often in the city. The heater was placed in the kids’ bedroom, and set to around 67 degrees (Fahrenheit). Upon our arrival after a few days away, the adjacent rooms were always 60 degrees or warmer, and the upstairs was always warmer than 50 degrees. From a starting point like this it was quite easy to turn up the boiler, start a fire in the woodstove, and be down to shirtsleeves within no more than 2-3 hours. One other new (more like forgotten and found again) fact is that our energy evaluation also included a calculation of peak heating loads for the home and boiler system, which actually end up matching quite closely to the calculation I did above. The HERS calculation of peak heating load for our house is 23,400 BTU/hour, which including the caveats that I mention above, is relatively close. This 23,400 number is the amount of heat that would be needed to keep up on the coldest days of the year, not the typical winter day that I tried to estimate for. This peak load calculation also showed our actual boiler specification, with a max heat output of 136,000 BTU. This is nearly 6 times our maximum heating load and is majorly overkill, but I have heard time and again that heating and cooling contractors usually overbuild these systems, and our house does require a much smaller heating load than the standard home. roughly 15″ thick, trying to balance cost and efficiency. Another heuristic that I picked up from our architect is the 60-40-30-20 rule. This suggests putting R-60 insulation in the ceiling, R-40 in above grade walls, R-30 in basement walls, and R-20 underneath the basement slab, which is much closer to what we actually did. I’ve elsewhere heard referred of concepts similar to this, labeled as “the pretty good house“. While a house like this won’t reach that Passive House standard, it will still cut by half or two thirds the amount of energy needed to heat and cool a home. For those of you familiar with reading building plans, I have put up the final house plan with all building details, here. These seem to not often be shared, but I am not too concerned about someone copying our home; if you would like to borrow any details, please do so. Starting from the top, we built a cathedral ceiling using a single pitched shed-style roof. We used manufactured trusses with 3′ of depth built in for insulation. Into this space a layer of 3.5″ Roxul batt insulation was laid down covering the entire bottom of the ceiling cavity. Loose cellulose insulation was then blown in above, mostly filling the 3′ space, reaching an estimated R-80 for the ceiling. It was originally specified to be R-60, but there was enough space for more insulation, and cellulose is relatively cheap and easy to install, so a last minute upgrade was done during installation. With the energy modeling that we did after the house was complete, it turns out that the R-60 would have been sufficient, as only a very small proportion of the heat loss would have been through the roof even with R-60. Beneath the rest of the insulation was a standard polyethylene air and vapor barrier, preventing air movement and controlling water movement. The final interior layer is veneer plywood sheets that make for a very attractive ceiling to the room below. For the above-grade walls, we ended up using a double stud wall assembly. The structure of the house is built with 2×8 lumber, which allowed both for necessary support on the tall wall in the upstairs, as well as to give a deep space for insulation. The bays in this wall were filled with Roxul batt insulation, a mineral wool product. Mineral wool is a quite well regarded insulation, as it is very pest, water, and fire resistant, is easy to install, and holds its shape well, all leading to good long service. On the inside of this 2×8 wall is the polyethylene air/vapor barrier. Inside of that is a 2×4 utility wall, holding all of the electrical, plumbing, and data cabling. This wall is also insulated with Roxul insulation. 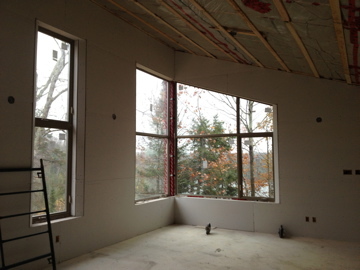 Finally, a standard layer of sheetrock provides the interior walls. A big advantage of the utility wall is that all of the openings that need to be cut, for outlets, fixtures, etc., don’t need to punch holes in the air barrier, keeping the air tightness higher. Outside of the 2×8 wall, there is a layer of plywood, then 1.5″ of Roxul comfortboard, which is very similar to the batt insulation we used, but a firmer and coming in sheets. By wrapping all the walls in mineral wool, it prevents thermal bridging, where heat would pass through the wood framing (which is a poor insulator compared to the insulation it holds in place). Finally, the exterior has 1×3 wooden strapping to allow for air circulation and water drainage, on which Hardie brand cement board is mounted. Altogether these walls are a nominal R-47 (the actual R-value is lower because of heat that conducts more easily through the wood studs than the insulation). For the below grade walls, which are about 5-6′ tall around two sides of the walkout basement, the final assembly was a simpler one. From the outside, there was a 2″ thick layer of rigid EPS (expanded polystyrene) foam, with a 4′ wide skirt of the same material buried approximately one foot below the outside ground surface. This skirt reduces the ability of cold winter temperatures from passing through the soil to reach the lower walls and foundation of the house. Essentially, escaping heat is slowed down as it has to go through or around that insulating skirt. Inside of the 2″ of foam, there is a waterproof membrane stuck to an 8″ thick poured concrete wall. Inside of the concrete wall is another layer of 4″ EPS foam, with the polyethylene barrier to the inside. The final layer is the same 2×4 utility wall mentioned above, covered by drywall. This total assembly measures R-40. Underneath the basement concrete slab is 4″ inches of rigid foam, giving R-16. A couple other finishing details really help to reduce the basement heating loads. First, the basement concrete slab is actually encased on 3 sides by foam, coming down from the walls, and then with the foam underneath – it essentially looks like a foam ‘bathtub’. This significantly reduces thermal bridging, making the diffusion of heat into the ground or concrete walls much slower. All the windows in the house have fiberglass frames, are triple paned with argon fill, and have an insulating value of roughly R-5. The windows facing south are all chosen to allow in more of the sun’s heat (called solar heat gain coefficient, SHGC), whereas windows facing all other directions have a low SHGC. The difference between them is that the high gain windows allow in approximately 50% of the sun’s heat, whereas the low SHGC windows let in only about 30%. The interesting thing about passive solar design is that much of the heating load is carried by the heat coming in the windows, with energy modeling suggesting that about 30% of the house’s total heat needs are being provided by the sun shining through the windows. The final thing that always needs to be mentioned when discussing a building envelope is air-tightness. There used to be ideas floating around that a house needed to ‘breathe’, but these ideas have long since been discredited, and high quality builders now look to build houses as tightly as possible, then actively bring in fresh air with a device like a heat recovery ventilator (HRV). Airtightness is meaured in air changes per hour (ACH), which calculates the total volume of air inside a building, and how many times in one hour that this much air would be replaced when a home is slightly depressurized with a big fan. Old leaky homes may have a number like 10 ACH (or even higher), meaning that the air inside is replaced by outside air about 10 times each hour when depressurized. Passive house rules require .6 ACH. Our house, with the polyethylene barrier mentioned multiple times above, measured at 1.47 when the house was half done, the outer 2×8 wall in place with the air barrier. The house is probably much tighter than that now that the utility wall, sheetrock, paint, and caulking are all in place, but we never quite got around to getting a second measurement after the house was complete. Another way to get a feeling for how this house is put together would be to watch the time lapse video below of the day a crane was used to put up the walls and set the ceiling trusses in place (video created by our builder Stephane Charette of Bala Structures – he is the one singing as well). simplify and make cheaper the house that we built. A lot of this sort of work shows up at the Green Building Advisor website, which I have become a frequent reader of. One other example comes from Ecohome, where our LEED certifier Mike Reynolds works. Their recent Edelweiss House is significantly more efficient than our home, and was also cheaper to build, as they did it with only a standard 2×6 wall and lots of exterior insulation. Needless to say, though the house that we have built is a very good one, there are many good ways to put together a high performance building envelope. Forest surrounds the home on all sides, with amazing views of a small valley to the south, and a back bay of the river visible about 150′ to the west of the house. We chose a hilltop location, in large part because of the views it afforded. The other advantages of this location are excellent southern exposure for both passive and active solar, as well as it being much less buggy than the surrounding lowland areas, due to it being drier and windier. That wind is a double-edged sword, however, as we are much more exposed to the whipping winds of storms and winter, which probably increase our heating loads a bit and have also put me in place to watch trees topple over and land within 20′ of the house during a particularly vicious summer storm. The clearing that we opened was just large enough to build the house and yard, a bit less than half of an acre. On the north, west and south sides of the house, this means that the forest begins only 20′ to 30′ from the house. To the southeast is a grassy yard big enough to cover the septic field, and to the east is a parking area with our solar panels tucked onto the north side of the clearing (to reduce the shading from the trees). Unlike most of the homes that are built along waterfront, we did not clear sight lines towards the water. We have a screened view of the water, which actually makes those glimpses out onto the bay more special. Trees were kept strategically so that the house would be well shaded during the summer season, both from the south, but most especially against the hot afternoon sun out of the west. The best way to accomplish this is with deciduous trees, red oak and sugar maple in our case, so that all through the leafy summer season the house stays as deeply in shade as possible, while in the winter the lack of leaves allows the sunlight to stream right in. The existing larger trees at our site helped to determine where we would set the home so as to best take advantage of that shading. The rule of thumb that I have read and been told multiple places is that one ought to be within 15 degrees of south to take advantage of passive solar heating, but with our site, we were able to square our house perfectly to the sun. This means that at solar noon the sun shines straight into the south windows of the house. This perfect east/west orientation gives a few unexpected benefits. One is that our entire house acts as a sundial; one can simply look at the angle of the shadows cast on the ground as the sun streams in the windows to know the time. Also, on the spring and fall equinox, we get the sunrise and sunset shining all the way across the home through the windows on the east and west sides. I noted this spring that in the downstairs bathroom (at the northeast end of the house), sunsets around the equinox are really the only time that the room gets direct sunlight at all. Passive solar design principles suggest that a longer east-west axis is used, with windows focused as much as possible to the south side. This allows for the south wall and windows to soak up the winter sun, while minimizing the east and west faces which can heat up excessively in the summer. We doubled down on this logic by making our home a rectangle elongated east to west, with a much taller south face full of windows. At the same time, the north side was banked into a hillside with only a few small windows, as north windows are always in the shade and constantly lose heat through the winter. We broke only one rule of passive solar design by putting a lot of west facing windows, but this was a worthwhile trade-off to capture the views of the river, and we do have trees that provide good summer shade to the west. With all of the big windows, especially in the upstairs, it certainly has the effect of bringing the outside into our home. 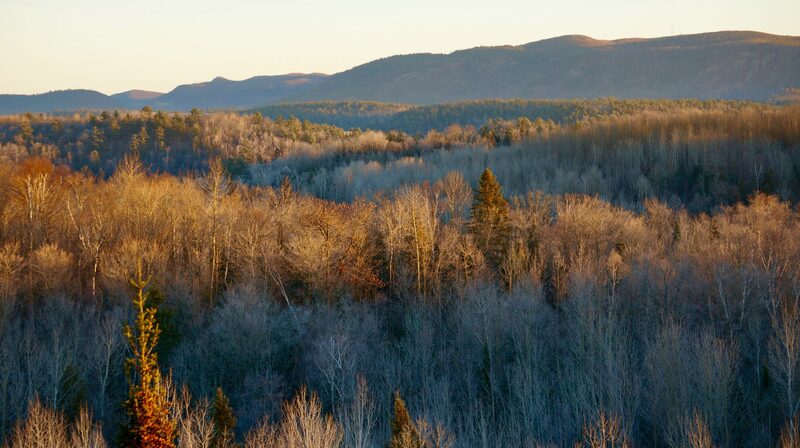 The views change with the seasons, with veiled views during the summer and fall due to all the leaves on the trees, with much clearer lines of sight in the winter. This allows us to really soak in the valley and hill to the south, and the river to the west. In figuring out details about the house, its orientation, and which trees to keep or cut, I spent a lot of time looking at the solar chart shown below. It packs an enormous amount of information into one graph, showing the length of the day, angle of the sun above the horizon and simultaneously its location in the daily east to west motion, and does all of this for every day of the year. With a bit of measurement and calculation, I could imagine how the sun would play across the house throughout the day and across the seasons, and plan for windows, shading, and solar panels. All in all, we have been very pleased with the siting of our home. I have recently read that there is some doubt as to whether applying passive solar principles is worthwhile in the age of superinsulated homes (see here), but I still wouldn’t change a thing. Even though we did a lot to maximize our solar gains, we at the same time were able to meet all of our aesthetic goals, both inside and out. 1 South as measured by the sun is a bit different from magnetic south, and solar noon a bit different from noon on a clock. Solar south is the ‘true’ south, and corresponds to the point where the sun is exactly half-way across its trajectory across the sky and at its highest point. Solar noon is the time at which the sun reaches that point. At our house, this works out to be at about 12:05 pm local time in the winter, and 1:05 pm in the summer. Your match of solar noon to the clock will depend on where you are located within your time zone. As a further aside to this footnote, I also need to mention that I had always thought that the ‘real’ time with daylight savings time was during the summer, probably because I enjoyed the brighter and longer afternoons. But actually, it is the winter clock setting where noon on the clock closely matches with the actual middle of the day as based on the movement of the sun.